Really? Really? Evelyn Bea is 6 months old today! Happy 1/2 birthday, Bea! I would say where has the time gone, but when I look at her I know. She is just days away from sitting up on her own and she can roll over like no one’s business. She got her first tooth two days ago. She has probably put on ten pounds since her birthday- all those all-night-long nursing sessions have to be going somewhere! The biggest change is in her personality these past couple of weeks- she knows exactly what she wants out of life and that is exactly whatever mom happens to be holding in her hands at any given moment. 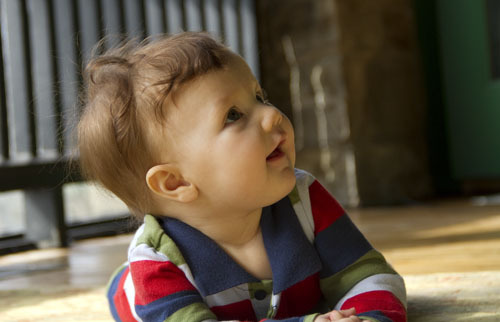 I used to scoff at the warnings on plastic bags- who out there would actually let their baby play with a plastic bag? Um, turns out I would, if she protests loud enough when I try to take it away. Don’t worry, I kept my eye on her. Plastic bags make awesome crinkly sounds. 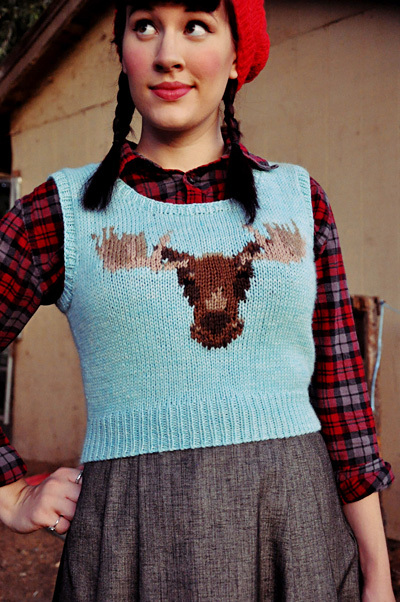 Unrelated, but totally fabulous, is this moose sweater-vest knitting pattern that showed up in my inbox yesterday. Don’t be shocked when I show up at your door sporting this piece of awesomeness.